Gov. 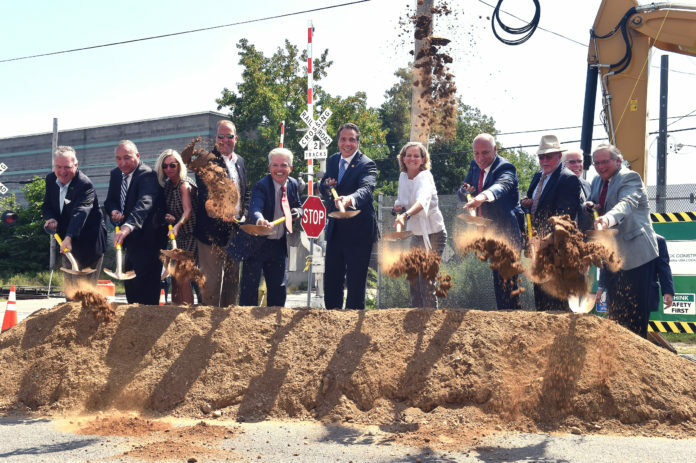 Andrew Cuomo joined local officials last week at a ceremonial ground breaking to kick off the Long Island Rail Road Third Track Project that will add a track along the 9.8-mile Main Line between Floral Park and Hicksville. “Since the 1940s, people talked about adding a third track and modernizing the Main Line corridor – and now we’re actually doing it,” Cuomo said at the event last Wednesday at the Yes We Can Center in Westbury. Preliminary work has already started on the $6 billion project, which is expected to be complete by 2022. The project will create “smoother and more reliable service” for LIRR passengers and improve public safety, Cuomo said, according to a news release. “The LIRR is the backbone of the region’s economy and this expansion effort will boost growth for generations,” Cuomo said. The project will eliminate seven existing street-level grade crossings along the route, including those on Covert Avenue, New Hyde Park Road and Willis Avenue. Five stations, including the New Hyde Park and Mineola stations, will be improved. There will also be ADA-compliant elevators put in at Floral Park’s station. The project has faced pushback from residents in areas near the construction. Many have said the noise from construction will be disruptive. In Cuomo’s news release, he said the state is using a “comprehensive noise abatement program” and will build the track with advance dampening technology. The project will also include sound-reducing walls along residential areas, according to the news release. State Sen. Elaine Phillips (R-Flower Hill), whose district consists of much of the area along the Main Line, said her role is to be a “voice for the communities and residents that this project directly impacts,” and plans to continue to advocate for them.